When I was growing up and learning to love music, much of it was described as 'alternative'. It's not hard to figure out the connotation: pop music was understood then as a duality - that which was mainstream and that which was not - a classic Venn diagram with a single circle. One set inside, and one set outside. Alternative music was defined as much by what it wasn't as what it was. This duality also helps to explain how 'alternative' also felt like a lifestyle, or maybe a culture (counter-culture?) as much as it was a music category. The kids who listened to alternative were usually looking alternative. They were very likely reading alternative, watching alternative, decorating alternative, and maybe even eating alternative, too. Many of the artists making alternative music cultivated an outsider or unorthodox image to reinforce their music. Otherness was oftentimes both the means and the end. Brilliant songs like Suzanne Vega's 'Left of center' from the soundtrack of Pretty In Pink (John Hughes's alternative take on Romeo & Juliet) expressed what we alternative kids were feeling: 'If you want me / you can find me / left of center / off of the strip / In the outskirts / and in the fringes / in the corner / out of the grip'. Lyrics of alienation were a dime a dozen. Consider Ministry's early classic 'Every day is Halloween': 'I dress this way just to keep them at bay / 'cause Halloween is every day / Why can't I live a life for me?' And Bronski Beat's gay liberation anthem 'Small town boy' could, with only slightly vague lyrics, resonate universally: 'Mother will never understand why you had to leave / but the answers you seek will never be found at home'. Much of the self-expression is easily diagnosed as the eighties version of being different for difference's sake, and of course that's nothing new. But I do think the eighties were a turning point in some ways. Economic prosperity gave more of us the luxury of cultural investigation, self-expression, and the material consumption of others' expression. A profusion of media technology made it easier to see and hear a greater variety of artistic products, and it enabled more artists with more diverse points of view to receive greater exposure. And the strange tension between multiculturalism and xenophobia that played out in the eighties made many things both exotic and accessible, taboo and palatable at the same time. We know now that the roots of indie pop and indie rock are found in the eighties (if not the seventies) - NME's immortal C86 compilation might be considered the point of critical mass. But 'indie' - short for independent - didn't really enter the lexicon until some point in the nineties. Originally referring to the origin of the recording, either self-produced or in association with an independent (i.e. not a major corporate) record label, 'indie' soon came to describe the aesthetic of the artists and their music, regardless of their label affiliation. Today artists may be needled a little by the indie community if they release indie-identified music on a major label, but there are plenty of artists doing it, regardless. 'Independent' casts a very different light on the music that now holds essentially the same place that alternative music did then. The negative shading associated with non-mainstream music has been largely left behind with the 'alternative' moniker. (Think of the difference between 'alternative lifestyle' and 'independent lifestyle'.) There is no longer a closed circle around a mainstream campfire, beyond which all this other music is pairs of blinking eyes. The people who enjoy indie music tend to look shockingly like the rest of the population (many of us freely admit to enjoying artists across the music spectrum) and the artists who make indie music no longer seem to be very concerned about cultivating an image that distinguishes them from the mainstream, either. Again, I think this is the product of another specific decade. Economic growth was no longer front page news, and as the boom mentality wore off, so did the glamor of popular culture. Consider all the rock and pop music genres that suddenly downplayed the visual component in the early nineties, and all the visually oriented genres that suffered a backlash - you can name them. A new profusion of media technology made it even easier to circumvent the traditional - and controlled - paths for disseminating music and information about music. And things that had once been exotic and taboo were increasingly, well, usual; it seems the focus shifted from being different to being expressive. Some of the new anthems reflected that shift in perspective. 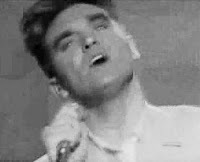 Consider Morrissey's 'Sing your life': 'Others sang your life / but now is a chance to shine / and have the pleasure of saying what you mean / Have the pleasure of meaning what you sing'. Or Belle & Sebastian's 'This is just a modern rock song': 'This is just a sorry lament / We're four boys in corduroys / We're not terrific but we're competent'. Or the ominous-sounding 'Evil' by Ladytron, which turns out to be rather laissez-faire: 'This is happening for your pleasure / at your leisure / Use your evil / when you want'. We are to some extent a product of our time, and I am still regularly drawn to the differentness of my older alternative music. Clearly I am not alone, considering the influence alternative currently has on various pockets of the indie spectrum. (Tellingly, though, the most visually striking new sub-genres tend to be explicitly indebted to alternative forebears.) That said, the expressiveness of indie is satisfying, and it's probably a culturally better adjusted iteration of the great adventuresome music with which I grew up. Without being too academic about it, there might be a Hegelian dialectic here somewhere: mainstream pop as the thesis, alternative as the antithesis, and indie as the resulting synthesis. Perhaps this is more about me growing up than anything else, and I'm comfortable with that possibility. I have often felt that the best scrapbook of my life would be composed not of photos and clippings, but of the songs that have meant the most to me at each point in my life. Before, I wanted to feel unique, and lately I've been more secure, more able to enjoy my own subtleties. How nice to have a great soundtrack for both.